AROMA COLOR - permanent hair color cream for a radiant and vivid hair color. The formula enriched with intensive pigments and natural macadamia oil protects and nourishes hair during coloring. Macadamia oil is famous with its restoring and therapeutic features. It hydrates and strengthens the hair fibre, while giving a dazzling shine and more intensity of the color. The conditioner with a natural recovering complex of aloe vera and jojoba oil gives the hair velvety softness and helps make it easier to comb. More than 50 years women in Bulgaria trust the consistent results and proven quality of AROMA COLOR brand. Active ingredients in the new enriched macadamia oil formula of hair dye improve dissolving of pigments, ensure deeper penetration into the hair thus making the color last longer. AROMA COLOR offers a palette of 30 saturated and brilliant shades. Guaranteed results – without grey hair! The hair dye and developer must be mixed together always in 1:1 ratio. Apply the mixture on the hair, keep it on for 30 minutes and wash it. After washing apply hair conditioner to fix the color and wash the hair again. Always performs a skin sensitivity test 48 hours before use of the product. The test is a reasonable protective measure. This test can not guarantee, however, that you will not have an allergic reaction in the course of coloring hair. It can occur even if you have used before hair dye of this or any other brand. AROMA COLOR BRAND № 1 OF BULGARIAN MARKET. AROMA COLOR is the expert and trends setter in hair coloring and hair care. 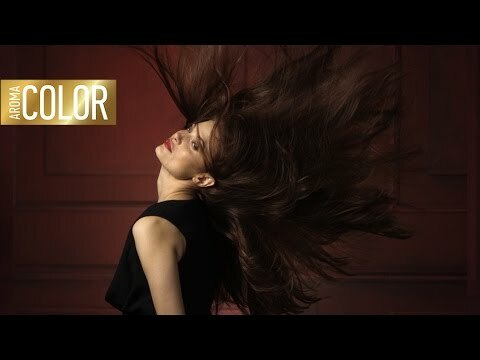 How to choose the right time for hair dyeing? When is it best to color your hair?